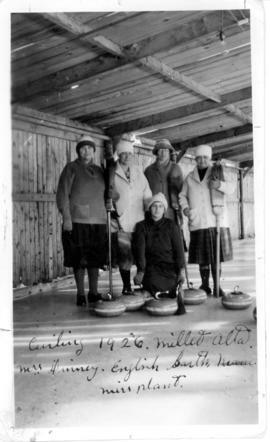 Itemis-mil-1-2 - Ladies' curling rink, Millet, Alberta. Itemis-mil-1-3 - O'Mara boys on a mule. Itemis-mil-1-5 - Portrait of a child, a member of the Kinchella family. 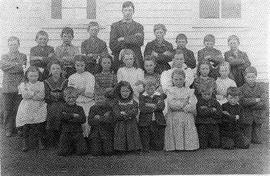 The Millet and District Historical Society organized on November 30, 1976 and became a society on February 25, 1977. Its first project was a compilation and publication of a book on the history of Millet, Alberta, entitled Tales and Trails of Millet. Some of the photographs used in the book were donated to the Society by the original owners, and the Society continued to collect photographic documentation of the community and its families. The collection consists of original photographs, photographic copy prints, and laser print copies of images documenting the community of Millet, its public life, and its families.